Holy Trinity parish is mostly second and third-generation American born, with a few immigrants. The founders came from various parts of Greece in the early 1900s. Many came to work in the steel industry that Pittsburgh was synonymous with for more than 100 years, and other industries. Eventually they established their own businesses. . . .
Holy Trinity Church owns its own cemetery in the nearby community of Allison and the Chapel of St. George is located there. The first Holy Trinity Church was located in another part of north Pittsburgh, in a commercial building, but moved to other locations. The parishioners struggled in many ways, especially financially. 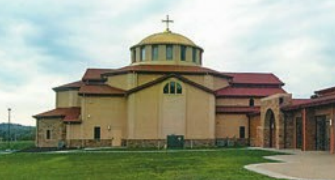 A commissioned "dues" collector would go door-to-door to all Greek Orthodox households in the community to collect the contributions for the coming Sunday's liturgical needs, including candles and utilities. Monthly dues were 25 cents. Men would go to the nearby Ohio River to gather sand for the candle stands. Others would cook a meal for the community priest who, in the early days, did not have a regular salary. Men and women of the parish drama troupe would put on Greek plays and comedies, with proceeds going to the church treasury.